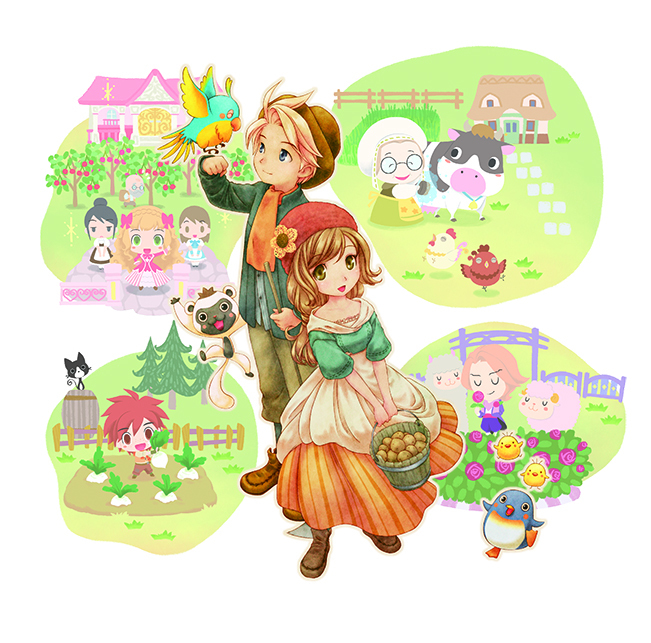 Let’s go over this one more time: this is the farming game you were thinking of when we first reported on a game translated as “Harvest Moon: Linking the New World.” The Lost Valley is what Natsume came up with when Marvelous wanted their own publisher, XSEED/Marvelous USA, to localize the game. The reason for this: while Marvelous was the rights holder of the IP, Natsume was the rights holder of the name. 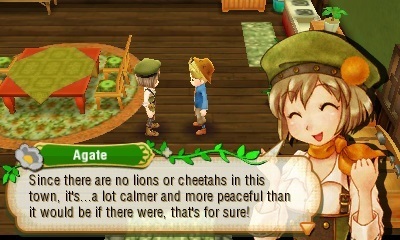 And, since Harvest Moon is pretty much the only name Natsume has anymore, it made sense that they would want to keep it. As for Marvelous and XSEED, they worked hard to bring us the next installment of the true farming series that we’ve grown up with since the mid 90s. AND IT! IS! GLORIOUS! …assuming you’re OK with some of the decisions made for you. Let’s start with placement of your farm. Your home base is away from town at the end of the road — well, almost the end of the road; one more farm is farther down. This takes you quite a ways from the town, which is a shame when Oak Tree Town starts to become as lively as Rune Factory 4’s Selphia after working hard at beautifying the town and raising crops and animals on your farm. Specialty fields are on the way to town. The trade-off for this is that you are able to pass by the 10 specialty fields. These are fields where you can grow specific crop types, like tall crops, leafy crops, honey, mushrooms, tea leaves and several others. If you control all the fields, you can do your work as you make your way to town. The set-up works well, but, being someone that grew up near a city, I’d prefer to be near the town. At the very least, I’d like to have a choice of where I can set up shop. Then there is the Safari. 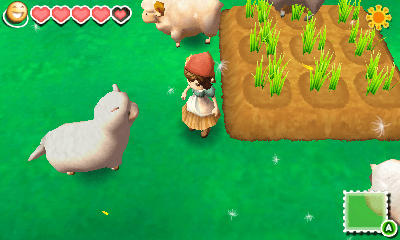 This is a fun little area that features an area where you can take your animals to in order to de-stress and potentially improve their produce quality — such as your cows making Milk+ instead of normal Milk. In addition, there are animals that vendors will give you as gifts that you set free in the Safari (or other parts of Oak Tree Town, in some cases) which makes the area more lively. While at the Safari, you can interact with the animals, collect items you can’t find in town, fish and mine. One of three additions you can make to the Safari. However, there is a number of issues with the Safari. First, mining is very limited. As a matter of fact, the only place you can mine any jewels in the game is in a crack in the wall of a hill. That’s it. Second, there are only two sections to the Safari (as far as I know from being over 150 hours into the game) — an East side and a West side. The West has a pen where your animals will stay during your time in the Safari. The East side has the mining and fishing area. There are also some things you can build in the Safari, but they just get tacked onto the given land instead of expanding the Safari. A definite misstep. There’s also an interesting issue of not having a clear way to tell what people are feeling about you. Usually, you get a little menu area where you can check on your relationship levels with other people. Not in this game. However, there are still ways to figure it out. Marriage candidates will have a flower next to their names that changes color as your relationship with them grows. You can also check it for each individual by hitting the L Button and seeing the person’s reaction above their head. Interesting, but not something I prefer. Bachelors and Bachelorettes have a flower along with a stem that adds more flowers as the relationship grows. Found on most courtable characters. Also, I have to call out what I thought was a bug but is turning out to be more of a deliberate choice by the developers. Kamil and Licorice, the 6th Bachelor and Bachelorette respectively, are missing the flower next to their names up until you start dating them. Supposedly, it’s because those two are supposed to be more difficult to court. However, that logic seems ridiculous when you remember that you just have to tap the L Button to see what someone is thinking. I seriously don’t understand this choice. It’s also a frustrating choice because I actually ignored Licorice for a while because I forgot that I could court her. And, continuing with people, I said earlier that Oak Tree Town gets rather lively. 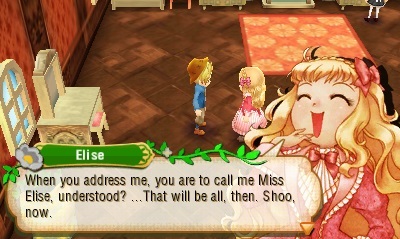 However, unlike conversations in Rune Factory 4, they aren’t quite as random as to which of the conversations happen and stay more like earlier games in the series where new things only really get said when they start liking you more. Also, I wish there were more two-way conversations — by that, I mean that I wish your character could actually talk to the NPCs instead of just doing that wild gesturing they do when they explain things that they’ve been doing since Magical Melody. You will also get facial reactions when you talk to the main NPCs in town. Music… Yeah, there’s really nothing to say about music. It works, in a way, but, as with other games in this series, it gets repetitive incredibly quickly. I wish that one of these games would have the occasional remix or an entire line-up of remixes that get used for a particular season that gets shuffled in with the main theme. It’s not like there hasn’t been something different done with the music in previous games in the franchise. For instance, after some time in Rune Factory 4, you can trade in Prince Points for music from the different Rune Factory games. In addition, the music in your house will change twice during the game: once after you get married, and once after you have a kid. This can happen. I’m sorry if I keep bringing up Rune Factory 4. It’s just that the game was recent and did so many things right. Plus, it’s also part of a sub-series in the franchise. It just makes sense to compare the two… at least, more than Lost Valley. Also, don’t take my complaining as me hating the game. 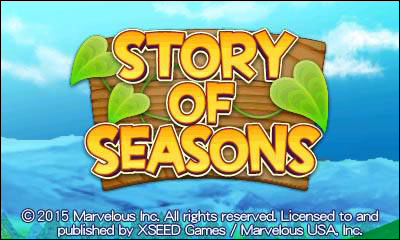 I like Story of Seasons. I think the biggest thing is trying to get past the major change in XSEED doing the localization. For some reason, I was thinking that it would result in some gigantic difference between this game and previous Natsume-published games. The only really noticeable difference is that there is wine instead of the soda that Natsume would change it to. Other than that, it looks like the familiar series you’re used to. But again, there are things that I enjoyed about this game without any major caveats. Raising animals is fun, particularly with the types of animals that you can raise. You can raise different types of cows, sheep, goats, camels, chickens, llamas and more. It’s quite cool going into your barn or coop and seeing all these different animals together. Speaking of vendors, there are seven that come to the town, each representing a different country. The more you ship and buy from these vendors, the more items that are available, the more wild animals they’ll gift you with, the more travelers that will come to the city, and the more lively the city will be. The first five vendors will unlock fairly easily with just needing to hit certain money goals and the right point on the calendar. The last two will be fairly difficult, needing to ship large amounts of specific items like seeds, clothes, tools, decorations and furniture. But it’s still fun. The game looks graphically appealing. I can’t say how it compares to the previous main series games on 3DS — for all games I’d say that it’s better than Rune Factory 4 — but it does look like a more polished version of the GameCube era games. 3D doesn’t really do much for me, but that’s not much of an issue. It all looks fine. Farming in the series has never been better. 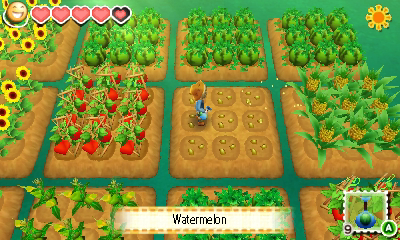 The absolute strongest thing about it is the farming, which makes sense since this is a farming game. I’ve always preferred 3×3 farming instead of “1-seed, 1-plant farming,” and this game has the 3×3 setup pretty flawlessly. You till the land once to create a 3×3 space, then plant, water, harvest and pick up all nine crops in the space by pressing or holding a button just once. Excellent work. 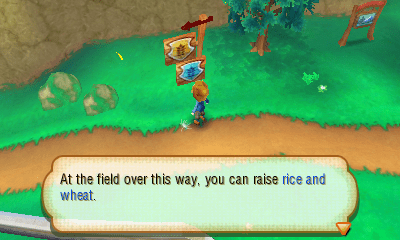 I wish this could be how farming works in the rest of the franchise. So, yeah, there are some great parts to this game. One final thing to note is the multiplayer. 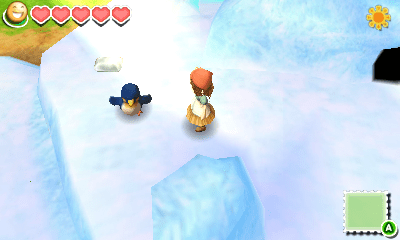 In this part of the game, you travel to the farms of other players and enhance their crops and animals. It works, but it’s limited to just crops on your farmland and not in the specialized areas. Make sure to have something on hand you can send as a gift. Overall, this is a solid first entry in the post-Natsume world of Bokujō Monogatari. While its competitor tried to reinvent the wheel in order to make a new series for itself, the guys at Marvelous took all that they’ve learned over the past 20 years of making this franchise — back when Yasuhiro Wada produced the game for Pack-In-Video — and gave us an experience that I think rivals some of the best the main series has to offer. If you had any doubt about which farming sim to get, this is it.